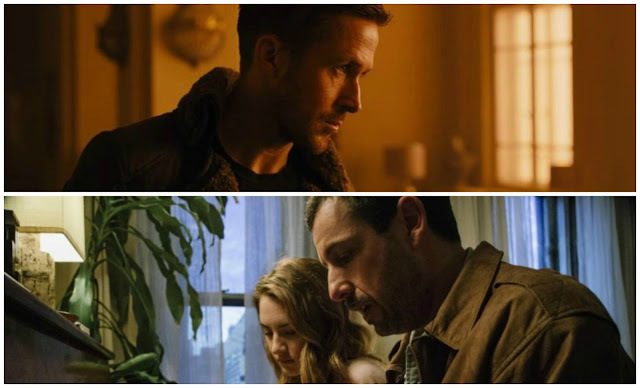 Thoughts on Storytelling, "Blade Runner 2049", and "The Meyerowitz Stories"
We have a knack this day and age for reinventing our most treasured stories. We reboot, remake, reimagine, reinvigorate, and open old adventures to make way for new ones. Not always a good thing, and it seems we can’t help it. We do this in life, of course, as well. I mean, do you ever remember things the way they actually happened? Still, not always a good thing, even if we can’t help it. Two new movies--one a huge (but flopping) sequel/reboot to a certified sci-fi masterpiece; the other a touching story about the stories of a family—came to me in the past week. Both play on the way we choose to tell stories. And the stories they tell are uniquely wonderful. “Blade Runner 2049” takes place thirty years after director Ridley Scott left us with those indelible “tears in rain,”, then that haunting question…are we actually living? The same question has been asked time and again in science fiction, but 1982’s “Blade Runner” really makes it stick, even through all the slowly-paced narrative misses that, I’m sorry to say, make the earlier film less of a masterpiece for me than for most. Its sequel, now in theaters, is a film that suffers from the same affliction. It is a big, epic beautiful piece of visionary genius that is…just…so…slow…and even boring at times. But the great thing about it, is that when it isn’t boring, it really isn’t. Its director, Denis Villeneuve (a Best Directing nominee for last year’s “Arrival”), is on string of cinematic successes not often seen. Its cinematographer, Mr.-way-overdue-for-an-Oscar himself, Roger Deakins, takes the retrofitted future of the original movie and raises it…way up there. This thing is absolutely beautiful, even in its darkest moments. Both of them bring their game, along with their world class production design team, as visual storytellers, making a much easier to follow, bigger, often more exciting, much deeper meditation on living in a dystopia built on the backs of “Replicants,” human clones, genetically modified for their strength, obedience, and used as slaves in off-world colonies. Ryan Gosling plays Officer K, a Blade Runner, a cop whose job it is to “retire” (kill) any “Replicants” still living on Earth. Like the Blade Runner played by Harrison Ford before him, he is tasked with a mission that becomes one thing, then another, then another, and so on, until what we thought we knew never was and what we now know is, well, mind-blowing. He is also a man in love with a being that is only real in a sense that we, in this world, see as some distant fantasy. Though, we do often talk to that lady that lives in our iPhone, so maybe this movie is as old as it is new. Only the best science fiction is both. To spoil any of the actual plot would be to cheapen the experience, and you should most definitely see this movie NOW, if only to bask at a true cinematic spectacle you only *actually* get at the movies once or twice a year. But it can safely be said that the choices Villeneuve makes in riffing on the stories of this futuristic world are smart, even in the long running time and the slow pacing. This is what the dime-a-dozen. 150-minute superhero movies wish they could pull off. This is what they’re missing in trusting us as intelligent people, who can think while being entertained. We only need a simple, well-told story and something amazing to behold in our sight. The story this movie tells is beautiful, full of love and hope, wrapping us up in its suspenseful grip one moment, then moving us in its love of humanity the next. Far away from the multiplex, in your living room, you could ask the robot living in your nearest device to play the new Netflix Original comedy-drama “The Meyerowitz Stories (New and Selected)” from director Noah Baumbach (“The Squid and the Whale”). It is the story, told in smaller witty stories-within-stories, of the Meyerowitz children, all middle-aged offspring of once somewhat-known sculptor and college professor, Harold, played by Dustin Hoffman. His oldest child is Danny, played by THE Adam Sandler in his best role in years and probably ever, is intense, classically the eldest child, unemployed, stuck in an empty nest (as his daughter leaves for college) in the middle of a divorce. His hip also bothers him, but he’s too neurotic and stubborn to go to the doctor. So, he limps. His younger half-brother is Matthew, the successful real estate CEO and apple of his father’s eye, played by Ben Stiller. His and Danny’s stories are told, selectively, in separate encounters with their aging father. Danny’s sister, Jean, played by a great Elizabeth Marvel, is given less to do but does get one of the more revelatory scenes about how we remember the stories we tell and don’t tell. All three Meyerowitz kids come together for their father’s first art show in years, a retrospective of sorts at the college where he held his tenure. All three of them, especially the boys, will experience awakenings of memory and old wounds and newfound respect, through dialogue as rich as Baumbach (one of the great indie writer-directors) has ever written, performed to absolute perfection. Hoffman is great as the arrogant artist, always feeling he’s owed something. Stiller is even better as the younger son, stuck with a father, who dotes on him behind his back and then silences him whenever he speaks. But this movie belongs to Adam Sandler, who brings his patented short fuse along with a lovable quality he has never once inspired. Under Baumbach, it seems, Adam Sandler is a genius, able to move me to tears with just a glance. Together, they make this little movie loving and fierce and hilarious and knowing all at the same time. This is the Adam Sandler we need all the time. Hilarious yet humble. Explosive yet understandable. These dualities are missing from the standard Adam Sandler character. Giving him an Oscar nod would reignite the Oscars…and Adam Sandler. He deserves it, at least, for the limp. Two movies nothing like each other. But two movies nonetheless that play with the simple idea of telling a story in new ways, in harnessing the old, the memories of the past, and making them something new and different. The stories we tell always evolve, new, old, and selected. Let them always be this well-told. Two very different and yet equally compelling stories. I saw The Meyerowitz Stories on Netflix but I avoided it because of Adam Sandler. Now I want to see it because of Adam Sandler. Great post! Yes. See it because of Adam Sandler! Blade Runner 2049 is nothing short of a masterpiece. It's Villeneuve, Zimmer & Deakins at their best. It's my #1 film of the year so far. Seen it twice already, & I'd gladly see it a third time. Haven't seen The Meyerowitz Stories (New & Selected) yet, but I might watch it this weekend. Thanks! I can't go all the way to masterpiece, but it is at least visually. Agreed on the work from those three. Just amazing! Do watch Meyerowitz. Report back. I would recommend seeing all of Baumbach's film. Maybe do this one as a double feature with The Squid and the Whale. Great post. If Roger Deakins doesn't win an Oscar I'm going to throw a massive fit. I really want to watch Meyerowitz Stories, I Hope i can get to that this week. Thanks. Deakins will get the Cinematography Oscar--lifetime achievement style this year. Guaranteed. Calling it now. Hope you got/get to it!